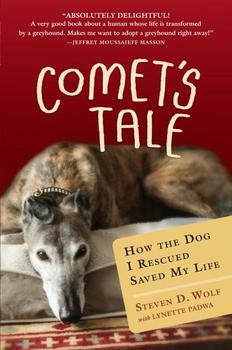 Comet's Tale: How the Dog I Rescued Saved My Life. 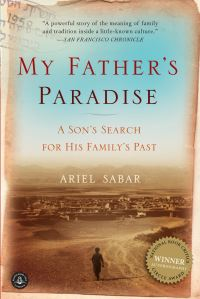 Forced into early retirement by a spinal condition, Steven Wolf reluctantly left his family and moved to Arizona for its warm winter climate. A lifelong dog lover, the former hard-driving attorney is drawn to a local group that rescues retired racing greyhounds. When Comet, a once-abused cinnamon-striped racer, chooses to “adopt” Wolf, he has no idea that a life-altering relationship has begun—for both of them. Racers, cruelly treated and exposed only to the track and cage, have no inkling of the most basic skills—walking on tile floors, climbing stairs, even playing with toys or children—so Wolf must show the mistrustful greyhound how to thrive in the real world. Gradually, a confident but mysterious spirit emerges from the stunning animal. And when Wolf’s health starts to worsen, the tables turn and Comet must now help Wolf with the most basic skills. Wolf teaches her to be a service dog, and soon enough she’s hauling his wheelchair at top speed through airport terminals, towing his cart through the grocery store, helping him get out of bed, and attracting friends to Wolf’s isolated world. She plays a crucial role in restoring his health and even saving his marriage. Their unshakable faith in each other makes them winners once again. A heart-warming story anchored with humour, wonderful characters, an amazing dog and a happy ending.